We’d love your help. 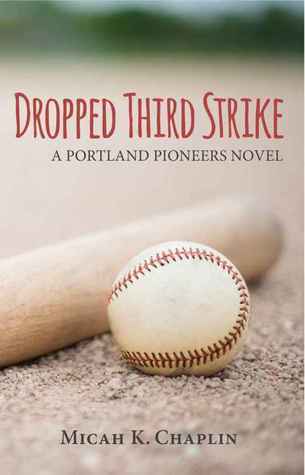 Let us know what’s wrong with this preview of Dropped Third Strike by Micah K. Chaplin. To ask other readers questions about Dropped Third Strike, please sign up. I'm a HUGE baseball fan, so I LOVED the baseball aspect of this book, but even for a casual or non baseball/sports fan, this book is an enjoyable read and I loved it! In so many books today (especially romance books), the characters are so perfect and "flawless" that it's not only unrealistic, it's ridiculous. Who can relate to someone who is so perfect? I love that the characters in this book have their own individual imperfections, so they are easier to relate to and seem more "real". Now, I do I'm a HUGE baseball fan, so I LOVED the baseball aspect of this book, but even for a casual or non baseball/sports fan, this book is an enjoyable read and I loved it! Now, I don't work for a MLB team (I could only wish), but I could relate to Katie in some ways. She has insecurities and hang ups that we all have (even if we wish we didn't). I also love that the author included a glossary of baseball terms (to help out those non baseball fans). I really hope this becomes a series because there were minor characters in this book that could have their own story line. As far as romance novels go, this is my first one. However, I'll read anything to do with baseball. The storyline is very well thought out and the characters' backgrounds intrigued me. The way Micah spreads out the history of relationships and backgrounds keeps the reader from the lull that some books have in their first half. The ending was not what I expected, which I appreciate. I'm certainly looking forward to the next in this series! I know my baseball, or at least I did years ago, as a life-long fan of my hometown Angels, but not like Micah K. Chaplin knows her baseball. Luckily, there were more terms that I understood than those that I didn't (and for those that I didn't, she supplied a nice little glossary in the back). What I didn't know, didn't distract me from the tale. I liked the looks back into the past to help us understand these characters, though sometimes I was wondering why there was so much anger from one and o I know my baseball, or at least I did years ago, as a life-long fan of my hometown Angels, but not like Micah K. Chaplin knows her baseball. Luckily, there were more terms that I understood than those that I didn't (and for those that I didn't, she supplied a nice little glossary in the back). What I didn't know, didn't distract me from the tale. I liked the looks back into the past to help us understand these characters, though sometimes I was wondering why there was so much anger from one and obliviousness from the other. My friend Micah K. Chaplin is so talented. This is the second of her books that I have read, and while I was initially worried that my lack of basefall knowledge, I shouldn't have been. I loved that the main character, Kate, was a woman working in a male dominated industry, and that the story was more about her learning to love herself than it was about her falling in love. Wow! I am not a baseball fan, but thoroughly enjoyed this book and was really into the game! As a friend of Micah's, I loved seeing her personality come out in this book! I cannot wait for the next book in the series and hope to hear more about Reid and Kate! Ok so I am slightly confused... Was that a cliffhanger?? Enjoyable and LOTS of baseball. Not your typical sports romance. The ending though??? Baseball and romance, a perfect combination! I loved this book! The characters felt relatable and true. The storyline was great and believable. I look forward to more books in this series!